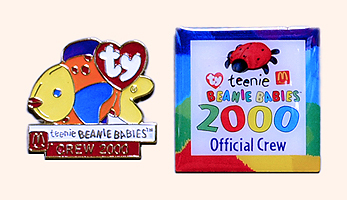 Lapel pins, sometimes referred to by collectors as crew pins, were sold to McDonalds employees through a Ty Teenie Beanie catalog in 1998. The 12 available pins were replicas of the Teenie Beanies given away during the McDonalds/Ty promotion. "GROUP II, CHINA" is printed on the back of these pins. 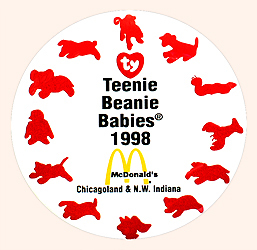 This 3-inch button was given to McDonalds employees in 1998 as an incentive to support the Teenie Beanie promotion. Some of the 1998 pins exhibit a variety of differing color hues. The four pins below were photographed together to show an example of the variations. These subtle differences were probably not intentional, but instead a normal manufacturing variance. 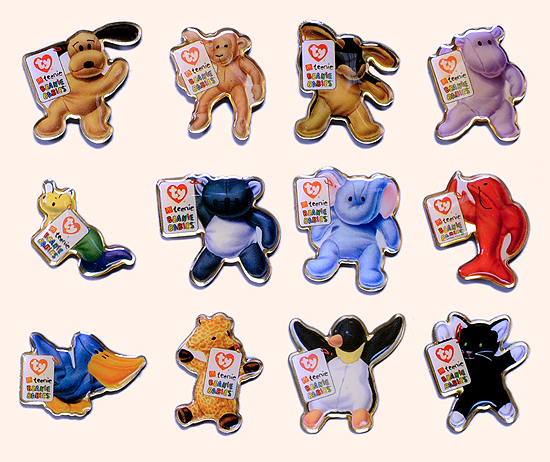 The McDonalds/Ty promotion in Germany in 1999 featured the same Teenie Beanies from the previous year's USA and Canada promotions. The German versions of the McDonalds crew pins however, were different from the USA pins. 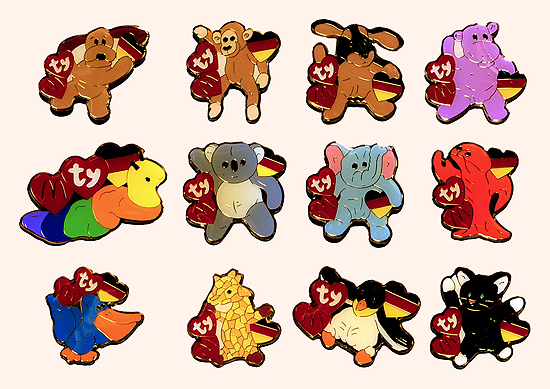 The pins made for Germany were heavier, more colorful, slightly larger and showed more of a cartoon style. These pins also had a heart with colors of the German flag. There is no printing on the reverse side of these pins. Some McDonalds employees in Germany were given a 2-inch crew incentive pin that showed all 12 Teenie Beanies in the promotion. The pins have either a black or white background but are otherwise identical. Only 1000 of each color pin were produced. There is no printing on the reverse side of these pins. 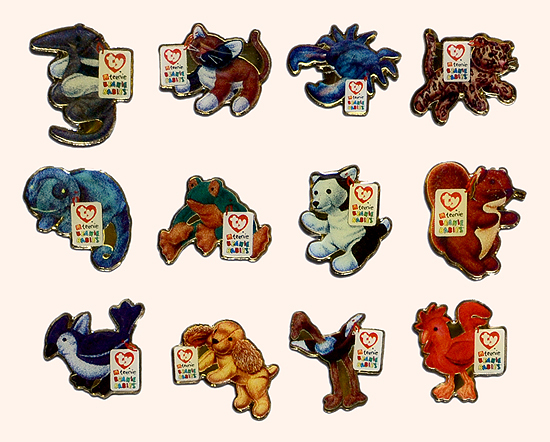 12 different lapel pins were available to McDonalds employees in 1999. The pins were replicas of the same Teenie Beanies given away with Happy Meals during that year's Ty promotion. "GROUP II" is printed on the back of these pins. This Official Crew pin featuring Smoochy and Spunky was given to McDonalds employees in 1999 as an incentive to support that year's Teenie Beanie promotion. 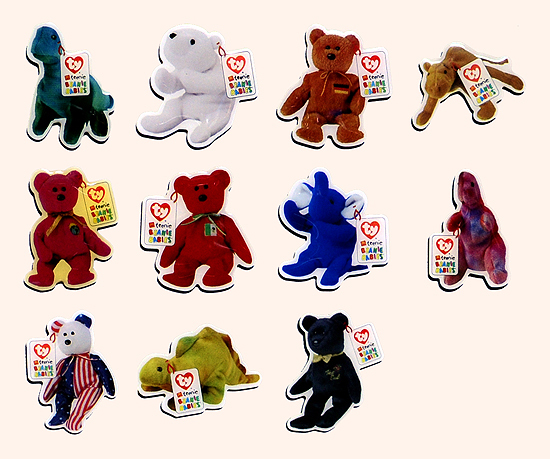 Four Teenie Beanie International Bears were sold by McDonalds during the 1999 promotion. The pins representing these bears were also sold to McDonalds employees. "Group II" is printed on the back of these pins. 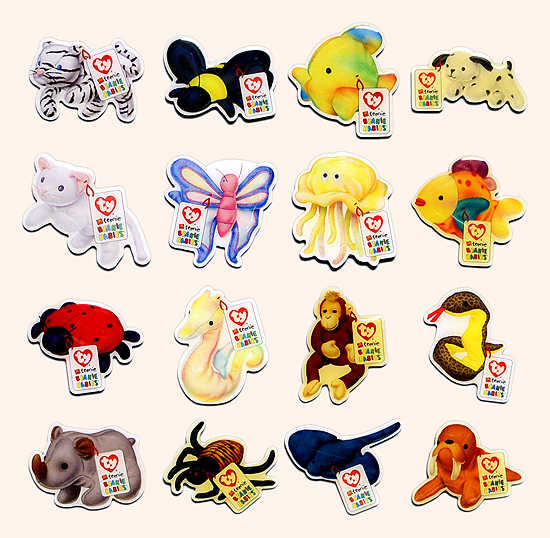 27 different lapel pins were sold to McDonalds employees for the 2000 Ty promotion. The pins featured all of the regular Teenie Beanies given away in Happy Meals as well as the Superstar Teenie Beanies that were sold to customers. "©2000 TY INC, GROUP II" is printed on the back of the pins. In 2000, there were two McDonalds employee incentive (crew) pins. One pin featured Lips the fish, and the other featured Lucky the ladybug. 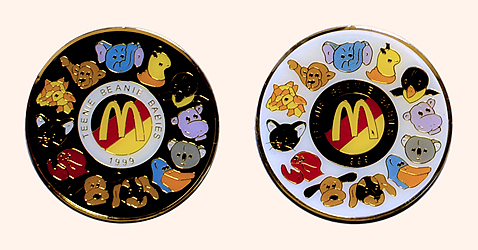 Employee lapel pins were not produced for the McDonalds Ty promotions after the year 2000. NOTE - depending on the resolution of your monitor, photographs of the pins and buttons on this page are generally larger than the actual size of the pins and buttons.